ST. GEORGE — Have you dreamed of soaring above the landscape like a bird, through clear blue skies with the wind beneath your wings and not a care in the world? Remember how amazing it felt? 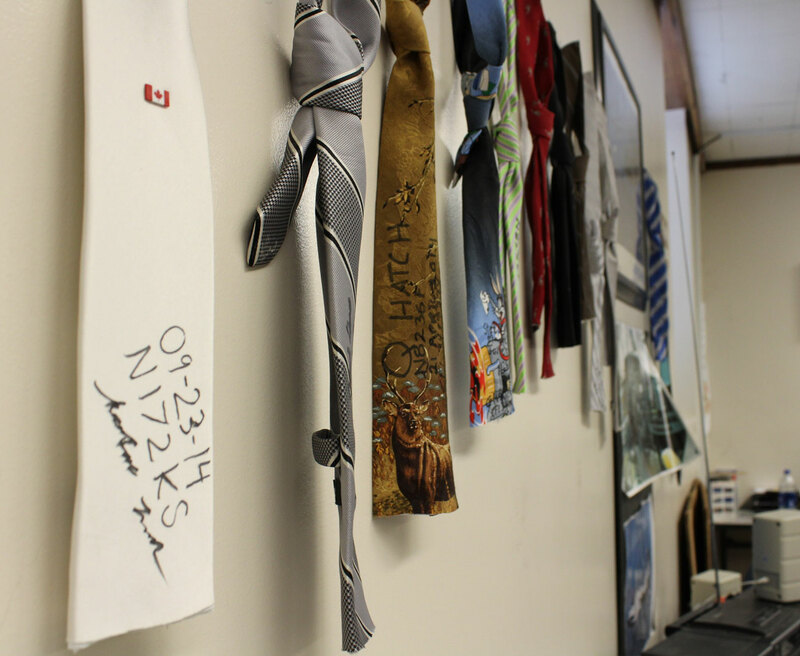 Dozens of Washington County students have had the chance to start making that dream a reality this year as part of Air Force junior ROTC program, and a select few are on the path of getting their private pilot’s license, even before graduating high school. For Dixie High School student Jackson Bandley, it is a goal he has been working on since turning age 12. Bandley is one of the few cadets actively flying in the program, with hopes of being on his first solo flight soon. He is also a pilot in the junior ROTC after-school drone program and had a chance to put his drone-flying skills to the test at December’s “Wreaths Across America” event where he provided drone video coverage. 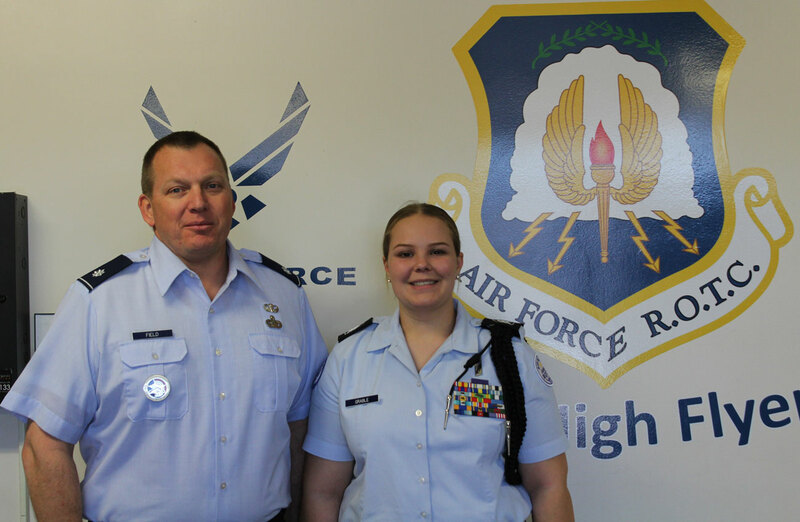 The Air Force junior ROTC program was started at Dixie High School by retired Air Force Col. Glenn Whicker in 2006 with the goal of giving students firsthand experience at flying while preparing those interested in the aviation field to take the Federal Aviation Administration written exam. Lt. Col. Ken Field, who assumed command of the program 18 months ago, said it’s unlike anything he as seen in 25 years of service and traveling around the world. “Col. Whicker did a great job setting this program up,” Field said, adding that he bets a lot of kids probably do not know they can get their pilot’s license while attending high school, potentially saving them thousands of dollars. He said it is a wonderful opportunity for the students. “We’ve been doing it for 12 years and nothing’s changed,” he said. This year the program has been able give over 80 cadets the chance to soar the friendly skies on flights, over twice as many as last year and more than any other junior ROTC detachment in the country. With over 2,000 hours of service at more than 80 occasions this year alone, chances are the community has caught a glimpse of the cadets dressed to the “nines” in blue with Dixie High School junior Jessica Grable, the cadet captain in charge of organizing events for the program. Grable said the events are a lot of fun and a great chance to hang out with friends even while looking after the younger freshman and sophomore cadets – a responsibility she takes very seriously. Among her duties are making sure everyone arrives when they are supposed to, in the right uniform and ensuring every event flows really well so the cadets are invited back the next year. It’s a leadership role that could be invaluable training for a possible career in the Air Force after high school. U.S. Rep. Chris Stewart, a veteran of the Air Force himself and a record-setting pilot, has been able to meet the young cadets of the junior ROTC a number of times. He told St. George News he is always impressed by their hard work and dedication to our country. “Our future is bright because of these young cadets!” said Stewart, who represents Utah’s 2nd congressional district. Although the majority of the 140 cadets are boys, about 30 percent are girls. Field said since he has began teaching at Dixie there have been about the same number of female commanders as males and they seem to thrive in the program. Nationwide less than 2 percent of junior ROTC cadets ever join the military, but Field said they are not running a military program; it is a citizenship program and they are not there to be recruiters for the armed forces – in fact the opposite. “We do use Air Force core values – integrity first, service before self and excellence in all we do,” he said but added that their charter is only to build better citizens. 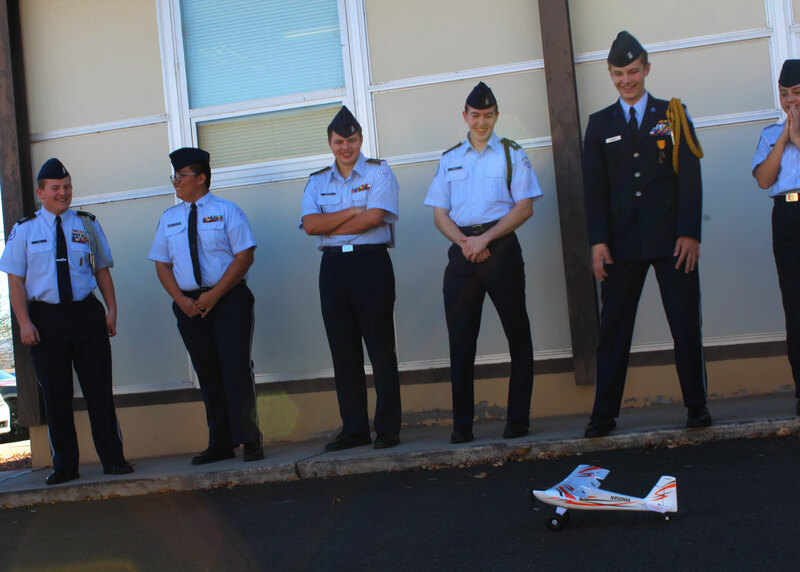 Juniors and seniors enrolled in the junior ROTC are also eligible to enroll in the Aviation Honors Ground School program that teaches cadets pilot training, aviation career opportunities, human factors, aircraft systems, aerodynamic principles, flight environments, communications, weather factors, navigation and can earn the commercial drone operators license upon completion. Every cadet gets an orientation flight and chance to manipulate the controls and fly the airplane themselves. “What we do is the safest demographic. We take an instructor, sit him next to a student, in a training aircraft with good weather – that is the safest demographic you’re going to find. It’s much more dangerous to drive to the airport than to get in that airplane with me,” Field said. 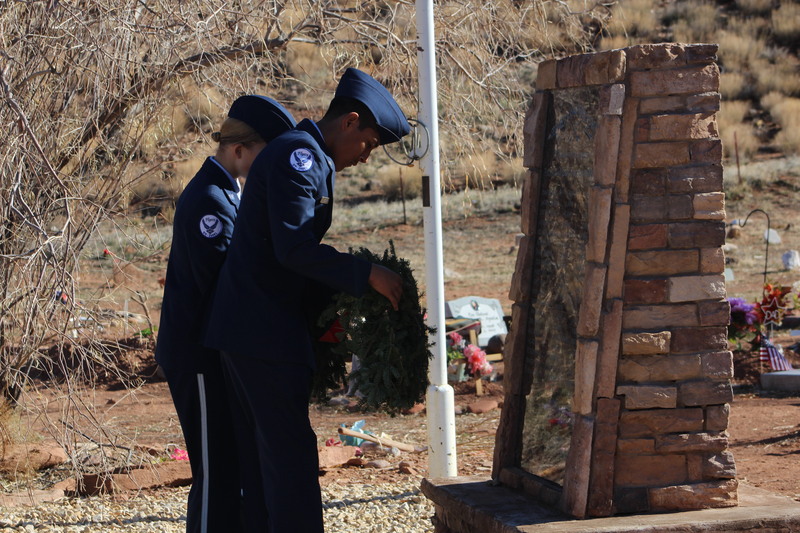 The ground school operates as a stepping stone toward a Flight Academy Scholarship offered by the Air Force. 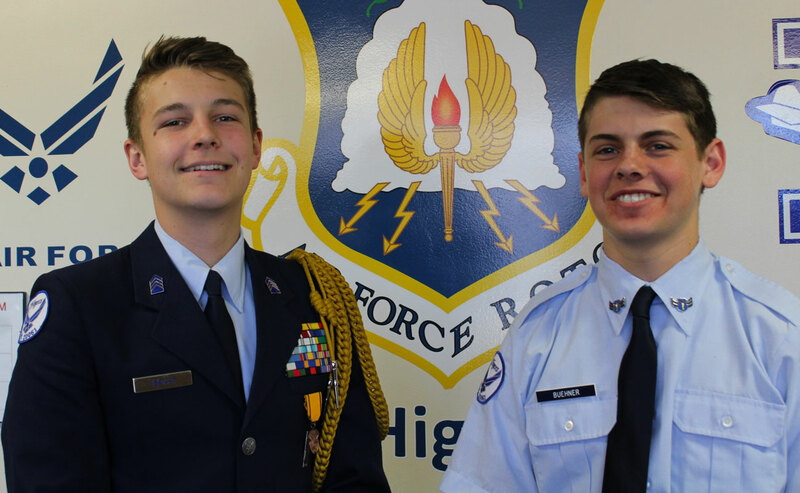 It is a complete private pilot’s license summer training program valued at $20,000 and this year, Desert Hills High School’s Jaxson Ybright and Snow Canyon High School’s Bridger Buehner were two of just four cadets in Utah to have earned the full scholarship to attend. Field said both cadets were highly qualified to begin with but he was surprised that after submitting only two applications from Southern Utah both were accepted into the highly competitive opportunity. Buehner, a sophomore in his first year with the junior ROTC, said although it felt really good when he found out he got the scholarship, he thinks there were probably a lot of other people that applied who deserved it also. He did reach the rank of Eagle Scout in the Boy Scouts of America and has had some leadership positions but said he thinks the recommendation from Field helped him out a quite a bit. “My dad told me and I just kind of sat there staring at the wall for a second. I couldn’t believe I got it because I am a first-year cadet,” Buehner said. Since first being fascinated by stories from his grandpa, a naval aviator in WWII, Buehner has wanted to join the military, like his father, a veteran of the Army. He said as a young boy he used to be deathly afraid of planes, but after taking a taking a long, private flight with his dad, he was never sick again. Now for him, flying is just really cool. “I guess I just felt better in control,” Buehner said. Ybright was sitting at his desk at home when he heard the exciting news he would be leaving for a couple of months this summer and would be coming home a pilot. He thought putting in for the scholarship would be like playing the lottery and never really expected it to come through. Like the pit in your stomach that you get when you go on a roller coaster except for eight, nine unending seconds. We’re just falling straight down and I held my phone out in front of my stuff in my hand and it started floating and I flipped my phone over and it would tumble in the air, like it was zero gravity. It put the biggest, stupidest grin on my face and I was just so amped the whole time ready to do more. I just wanted to do more. The summer program is six to eight weeks long and is held at one of nine partnering universities across the country, including Kansas State University, Auburn University and the University of North Dakota. Each cadet was able to submit a few of their top picks and while Ybright is hoping for Purdue University, Buehner has his sights aimed at Embry-Riddle University in Florida. “It will probably be a good experience to be away from home for a while,” Buehner said. The scholarship covers room and board, academics, transportation and all of the flight hours needed to get a private pilot’s license before coming home. More information about the program and events they volunteer at can be found on their Facebook page or by visiting the Dixie junior ROTC website.